This is a regular feature of the blog looking at the various iPhone Apps available. With the release of the iPad in the UK, this series will also now cover Apps for the iPad. Some of the apps will be useful for those involved in learning technologies, others will be useful in improving the way in which you work, whilst a few will be just plain fun! Some will be free, others will cost a little and one or two will be what some will think is quite expensive. Though called iPhone App of the Week, most of these apps will work on the iPod touch or the iPad, some will be iPad only apps. NewsRack is a full-featured RSS reader for iPhone and iPad with a unique interface. Skim over the latest headlines on a beautiful rack of newspapers or use the powerful classic interface to read and organize feeds. There is lots of stuff out there on the web, lots of news, blogs and other stuff. Stuff that I may find useful and stuff that I may want to pass onto others. I often get asked how I know about stuff, well I read a lot of stuff is basically the answer. A key information skill is the ability to sort the wheat from the chaff in the sheer amount of information which is thrown at you on a daily basis. I often see my role within the use of ILT as a gatekeeper to ensure that important and relevant stuff gets to key people in the college without overloading them with either lots of stuff or what can happen loads of irrelevant and unuseful stuff. Now I only have limited time, so I need to use tools to allow me to quickly and effortlessly sift through the information, picking out the gems and useful bits. I need to store some for later, others I will post out straight away. A key way in which I do this is through the use of RSS feeds from the various blogs and news sites. These automatically update throughout the day so that I don’t need to go back to sites and check if there is anything new, the use of RSS feeds allows the news and articles to be pushed to me. Even though I use RSS I don’t read everything, I just don’t have the time… when I do find a spare minute I will flick through the feeds to see what is interesting and new. I star things I think may be useful, interesting or to blog about later. I also will post URLs to Twitter or the VLE. My current setup consists on Google Reader on the desktop and I now use NewsRack on the iPhone which was recommended to me by someone. There is also an iPad version available too. As a result of using a service like NewsRack I can quickly browse news and blog feeds and am able to pick out the relevant and useful news and articles I need to enhance and improve the way in which I work. Yes the newspaper thing is a bit of a gimmick, but that wasn’t the reason I purchased the App. I like how it works and I like how it improves the way I work. This entry was posted on Tuesday, June 1st, 2010 at 8:42 am and is filed under ipad, iphone, iphone app of the week, news, rss. You can follow any responses to this entry through the RSS 2.0 feed. You can leave a response, or trackback from your own site. Thanks James. Looks a good app. I have almost abandoned Google Reader because when I am at my computer I am usually not reading with the pressures of other work. 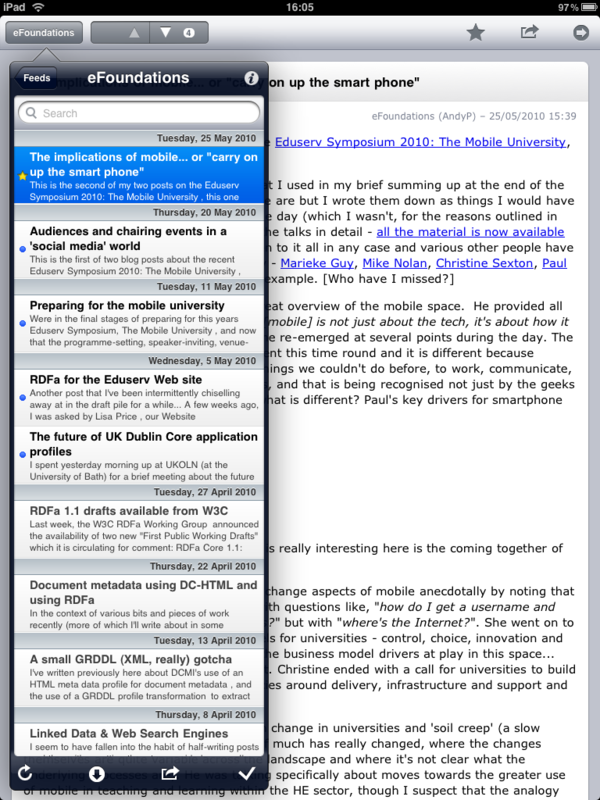 However, on the go I do have time I could use but GReader on the iphone is poor. I might purchase this one. Having said that a lot of my reading is done via email now. If I like a RSS feed I send it to me email via reblinks. This means it hits my workflow and available at my convenience. Labels and stars make it manageable. Not quite there yet but getting there… for me.